Despite public protests including a petition attracting nearly 8000 signatures, Transport for London has confirmed the demolition of Eduardo Paolozzi murals. Despite public protests and a petition that has attracted nearly 8000 signatures, Transport for London (TfL) has confirmed that three of the four arches at Tottenham Court Road station featuring murals by Eduardo Paolozzi have been dismantled. The Twentieth Century Society has revealed that they were informed of the news during a meeting last week with TfL and architects Hawkins Brown. The removal of the murals is a result of the development of a new Crossrail and tube station. 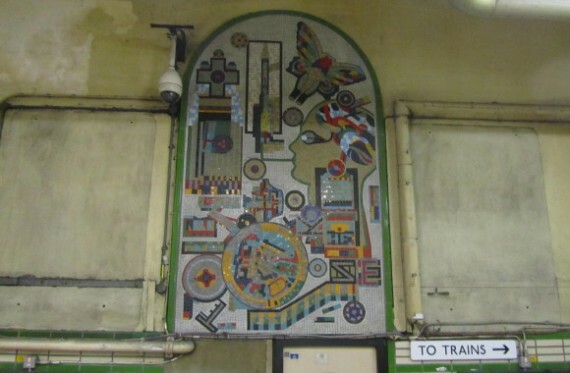 At the same meeting, the Society said assurances were given that the large Paolozzi mural above the former Oxford Street entrance to the station will be saved. It will be removed from its current location and relocated to a new site. Twentieth Century Society director Catherine Croft said of the news: “We are very pleased that TfL has confirmed that it is set to save the large entrance panel at the former Oxford Street entrance. They have also stated that we will be consulted on the methodology for removal and relocation. Croft also revealed that, had it not been for assurances given at the early stages of the project, the Twentieth Century Society would have moved to have the murals listed by English Heritage in order to preserve them. “We were given assurances when the station upgrade plans were first mooted that the mosaics would be safe, and because of this we held off putting them in for listing,” said Croft. Correction: The original headline for this article has been changed, replacing ‘demolished’ with ‘dismantled’.